There are many books about Hine’s photography, but this is the first full biography of a talented and complicated man. Today, Lewis Hine is widely recognized as “one of America’s greatest and most influential 20th century photographers and social reformers,” Duerden says. He is primarily known for his work exposing child labor practices, bad conditions in factories and mills, and for documenting the building of the Empire State Building. Even if you are not a historian or photographer, you will recognize many of the iconic photos taken during Hine’s career. In 1899, Hine met Sara Ann Rich while they were both students in Wisconsin. They married in 1904 and together made a life in New York. In 1901, Hine began working at the Ethical Culture School. New York City was undergoing a tremendous wave of immigration and a blending of cultures, with the extremely wealthy and the desperately poor living side by side. With this great disparity came the urban social reform movement, or Progressivism. Most of the Progressives were from middle class or upper middle-class backgrounds, but they were outraged by the hard living and working conditions of the poor. Hine also attended the Columbia University School of Social Work (1904-1907). It is easy to imagine how Hine used those skills to gain the trust of his photographic subjects. In 1905, he began photographing immigrants as they landed at Ellis Island. Later, he photographed children working in the mines and mills. 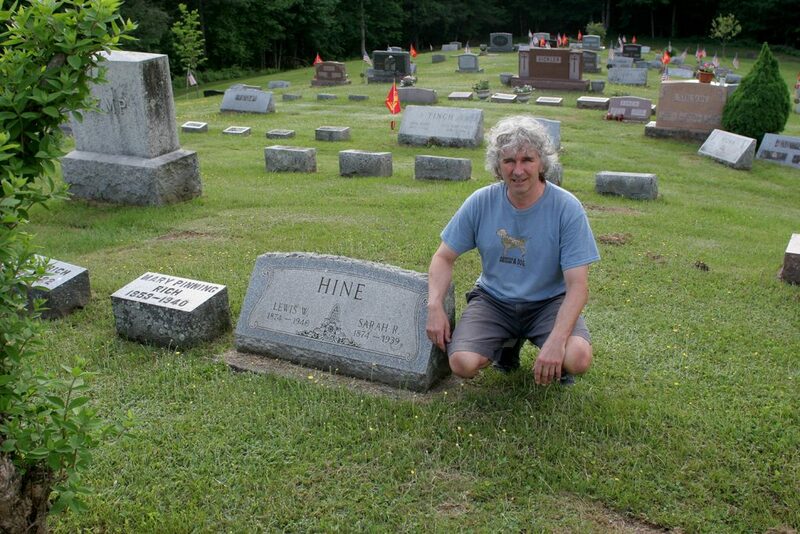 Sara Rich Hine’s parents moved to Franklin in 1918 after they lost their dairy farm in Wisconsin. Lewis and Sara and their son Corydon began visiting Franklin every summer and most holidays, perhaps a perfect antidote to his work recording the grim labor conditions of the poor. The stone house where they stayed on these visits is still on Route 357, just outside of town. Until the Great Depression, Hine worked steadily. But just as that economic crisis happened, the technology of photography was changing. Hine was now considered too old and his style too old-fashioned. He was never good at advancing himself and his career. Many of the people he had relied on for assignments all his life were no longer alive or able to hire him. By the late 1930s, his career was nearly over. In 1939, the Hine family home in Hastings-on Hudson was foreclosed by the bank. Hine had exhausted all financial resources. Sara died just before Christmas, 1939. Hine could not afford the cost of the funeral or the cremation, and had to turn to his wife’s family in Franklin for help. In November of 1940, Hine himself died. Corydon made arrangements with the Rich family to move the remains of both his parents to Franklin. During his lifetime, Lewis Hine and his family made very little money from his work. After his death, his art began to get the attention it deserved. In the 1980s, an art collector noticed that suddenly the market was glutted with prints “signed by Hine.” The dealer became suspicious and called in the FBI. Forensic studies revealed that the paper of many of the prints Hine supposedly made before his death in 1940 were in fact from 1950s, and some of the chemicals used were also blended much later! Work that has been vetted and shown to be truly that of Hine now goes for $10,000 or more. It seems tragic that such a talented man died in poverty. Timothy J. Duerden has written a compelling biography that includes both the artist and the man whose work did much to help the plight of those people he documented. His book, Lewis Hine: Photographer and American Progressive, is available at Blue Farm Antiques in Franklin, at The Green Toad in Oneonta, at Delaware County Historical Association in Delhi and online.